I NEED TO...remove end users' admin rights without backlash. Reduce licencing costs. Improve compliance. The onslaught of malware and ransomware has driven even organisations in minimally regulated industries to remove admin rights from all users. However, while locking down desktops reduces risk, it also significantly reduces end user experience quality. Users hampered by poor experiences produce less and call the help desk more. Those users can also react to system lockdowns by turning to ‘shadow IT’ work-arounds, creating new security risks. "What is admin rights removal?" For users with access to the exact capabilities and apps they need to do their jobs, admin rights removal isn’t an issue—if they even notice. Personalise a user’s environment at a granular level and they’ll never feel constrained. Risk varies based on end user context. Adjust policies accordingly—users will get it. If it’s not running, it can’t attack your endpoints. Spot OS and application adoption trends and out-of-compliance endpoints in your environment. Stop making and maintaining lists. Focus instead on who’s authorised to provide applications to users. Separate actionable endpoint data from the noise, track critical KPIs, and identify suspicious behaviour. When is a Lockdown Not a Lockdown? Handle exceptions with a self-service model that allows users to self-elevate, but has protection and auditing built in. Solutions from Ivanti allow IT to remove administrative rights, protect endpoints, report on risky behaviour, and enable regulatory compliance without degrading the user experience. Users who have the applications, personalization, and privileges they need to do their jobs don’t feel deprived—they feel empowered. 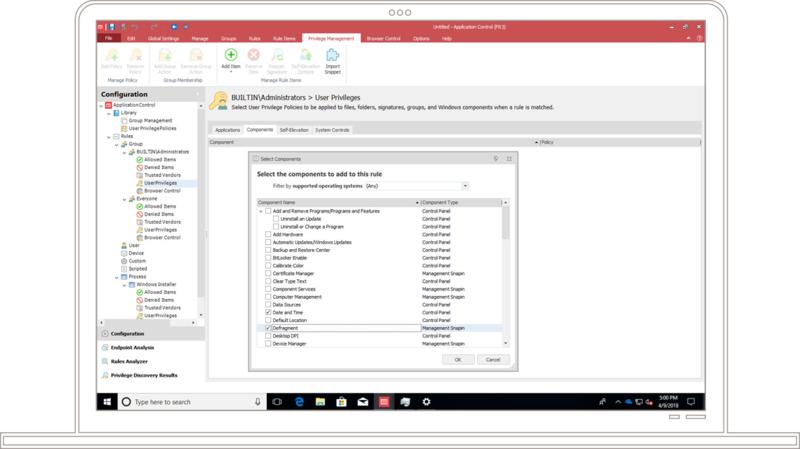 Endpoint control that reduces security risk without degrading user experience, by managing user privileges and policy and preventing unauthorised code execution. On-demand personalization and fine-grained, contextual policy control that optimises the end use experience and helps protect endpoints. Balance administrative rights control and user productivity demands, and users will thank you. Spot suspicious endpoint behaviours, such as unknown processes starting at logon. Know exactly who has admin rights, and see user self-elevation trends. Identify suspicious files introduced to any endpoint. Meet corporate and industry-based compliance mandates such as HIPAA, FINRA, and PCI by enforcing policy in real time during the user session, not just at logon. To optimise the user experience, multiple policies are processed in parallel. Capture all user-specific operating system and application customizations. Maintain customizations centrally to deliver a consistent, personalised desktop on demand. Cover most eventualities with application limits and time restrictions. Restrict access to network resources. Invoke contextual URL redirection, granular control over web application installation, anti-tampering, and change control. Support comprehensive auditing. Mitigate threats without manually managing extensive whitelists and blacklists and without creating user productivity obstacles. Trusted Ownership™ allows only applications introduced by trusted administrators to execute, so ransomware won’t run. 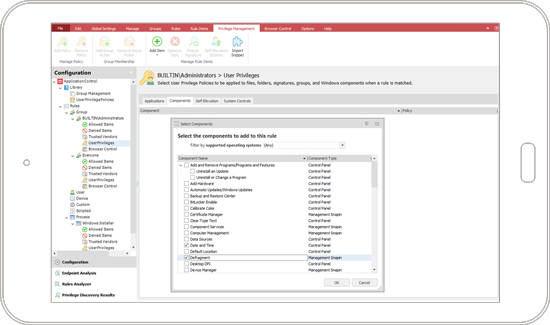 Apply precise user privilege levels with no negative impact on user workflow. Allow optional self-elevation based on pre-defined algorithms and capture the endpoint data needed to analyse how policies align with real-world business needs.